Rock Paper Lizard: Pied-billed Grebelets. 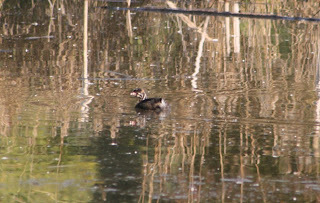 Back on May 22, and May 29, and possibly before those dates, I commented on a seemingly lonely and alone male Pied-billed Grebe in the pond at Garden City Park. You would see and hear him cowping his little heart out, in an otherwise grebeless world. 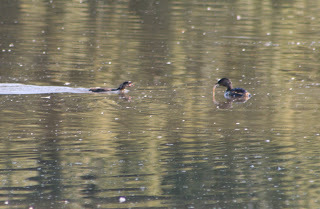 Well, magic happened--it seems that eventually he found love, because there are now at least two baby grebes in the pond, noisily (peep-peep-peep) pursuing a frazzled adult, who seems to spend as much time under water as possible (for the peace and quiet). Grebelet. Note the striping on the face. This is late for young, even young this advanced, but is within known records. The adult has caught one of those hard-to-spot Carassius auratus, which seem to appear spontaneously in urban bodies of water. Baby wants lunch. 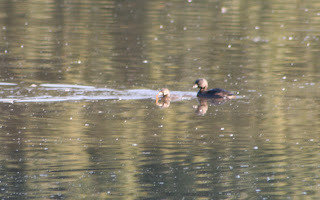 The adult seems torn, as if it wants to eat the fish, but the baby pleads effectively. And gets the goldfish. Garden City Park pond continues to surprise. 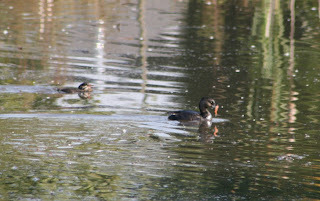 Thank you PG, although the grebe pictures were of the Hail-Mary distant-subject variety, where you hope the camera's auto-focus finds something worth cropping. I'm just enamored by the word Grebelet. I think that's going on the delicious word list. Thanks, Hugh!